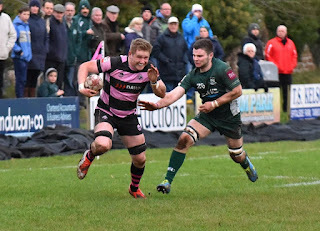 Ayr 1st and 2nd XVs have away matches this Saturday, travelling to Hawick and Edinburgh Accies in the BT Premiership and BT National Reserve 1 respectively. Every team that steps out on to the hallowed turf of Mansfield Park is in for a difficult afternoon, and it will be no different for Ayr as they take on the fiercely proud Hawick, who are currently languishing at the bottom of the table. There's nothing more dangerous than a wounded animal, and cheered on by a boisterous crowd, the home team will be looking to make a glorious comeback against the current league champions. "With new management in charge at Hawick, we expect to see a resurgence from their players," says Ayr head coach Calum Forrester. "Last week was our best performance to date, but we will need to raise our game again in order to build on that momentum." In the squad, Scott Sutherland and Danny McCluskey return to action after recovering from injury, and Ryan Grant is back in a pink and black shirt since rejoining Glasgow Warriors. His fellow Warrior Brandon Thomson is on the bench, alongside Stuart Collier, who could make his 1st XV debut. 15. Grant Anderson; 14. Robbie Nairn, 13. Scott Lyle, 12. Stafford McDowall, 11. Craig Gossman; 10. Frazier Climo, 9. Harry Warr; 1. Ryan Grant, 2. Lewis Anderson, 3. Steven Longwell; 4. Jonathan Agnew, 5. Scott Sutherland; 6. Tommy Spinks, 7. George Stokes, 8. Pete McCallum (c). 16. Stuart Collier, 17. George Hunter, 18. Michael Badenhorst, 19. Brandon Thomson, 20. Danny McCluskey. The 2nd XV take a very strong squad with them to Stockbridge for their match with Edinburgh Accies. After last week's five-try victory against Heriot's, they are focused on continuing that high-tempo form. Paddy Dewhirst and Lewis Young make a formidable half-back pairing, with pace and creativity throughout the backs. Adam Prentice is welcomed back to the front row, whilst the back row of Craig Brown, Gregor Henry and Cameron Reece has an exciting mixture of youth, speed and guile. 15. Zac Howard; 14. Jamie Bova, 13. Sam Graham, 12. James Pinkerton, 11. Euan Hamilton; 10. Paddy Dewhirst, 9. Lewis Young (c); 1. Fraser Miller, 2. Ruairidh Sayce, 3. Adam Prentice; 4. Jack Brown, 5. Logan Richardson; 6. Craig Brown, 7. Gregor Henry, 8. Cameron Reece. 16. Seth Rae, 17. Bill Lyburn, 18. Adam Paxton, 19. Alan Miller, 20. William Chan, 21. James Armstrong.